From time to time this column turns into an obituary. It is always sad for a columnist to write on someone who has just died especially when one has known the deceased closely. This is particularly so for me when I write about Edward Azzopardi whose career I have followed since the early 1960s. Azzopardi died this week at the age of 63 after a long illness. He was born in Paola on December 24, 1941, and was one of three brothers all of whom have played football at some level or other. Mario, the eldest, was perhaps the most gifted of the three. He was a member of Hibs' successful U-21 team of the late 50s but then he threw away what could have been a highly successful football career when he emigrated to England. Dennis, the youngest of the brothers, also played football, mostly for Floriana's reserves and junior strings. It was however, Edward who made the grade in top-class football. In the 1950s there were no football nurseries. Instead, the game was played in the streets and on abandoned stretches of land which in those days still bordered the towns and villages of the island. Every area in Paola had its own football team and in those primitive conditions the game flourished and produced some of the best Maltese players ever. The Azzopardis lived in Cospicua Road, only a few metres away from another great footballing family, that of the Theobalds. It was no wonder that the Ghajn Dwieli FT was always the one to beat in our daily football kick-abouts. From Corradino, Mario and Edward moved on to Hibernians' minors. The spotlight in those days was on Mario but when he left the attention fell on Edward. The fledgling young defender soon caught the eye of the Hibs' scouts and in 1960 he made his debut for the first team as a full-back. In his first season in the first team he won a league championship medal. He was hailed in Paola as the discovery of the season but unfortunately Hibs were very well served in defence in those days. Defenders of the calibre of Louis Theobald, Johnnie Privitera, Leli Attard and Salvu Gatt left very little space for a new up-and-coming defender. Edward would surely have made the grade eventually but with the impatience of youth he preferred to move to Floriana rather than wait for his chance with Hibernians. In Floriana, Edward found it easier to command a first-team place and before long he had established himself as the Greens' regular centre-half. In his first season with his new club he again won a league championship medal. In those days, Floriana were suffering a dip in performances. The great Ajax team was aging rapidly and it was time for re-building. In the following six seasons he spent at Floriana, Azzopardi hardly ever missed a game but he had only two Scicluna Cup medals to show for his efforts. This was a poor fare indeed by Floriana's standards. In 1967-68 Azzopardi requested a transfer and when Floriana refused he was sidelined for the rest of the season. 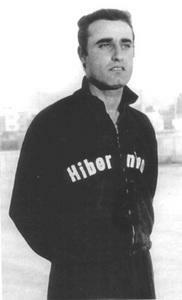 In 1968-69, Floriana finally let him go and he rejoined his old club Hibernians. This was perhaps the start of the best part of his career. In three eventful seasons he won the league championship, the FA Trophy, the Independence Cup and two Sons of Malta Cup medals. A series of injuries in 1971 kept him out of the game for two whole seasons and although he attempted a comeback in 1973-74 his best days were over and after only one league game he retired. Azzopardi will always be remembered in Paola and Floriana as an elegant, hard-working centre-half. The best epitaph one could give him, however, is that he was a humble, honest man who always gave his best for the team. Players of such integrity are unfortunately very rare in modern football.